The wordpress developer & WP publishers used to search for how to make website secure? How to secure WordPress website from hackers? Do you know security issues with WordPress while blogging? How to password protect WordPress to prevent loss? How to strengthen your WordPress database security quick? How to make your WordPress site secure from hackers? The quick answer is to install, activate, and configure the best WordPress security plugins. WordPress is the most popular blogging and Content Management System (CMS) platform on the Internet that makes it a target for hackers. I’ve observed many website owners bothering about the security of WordPress. There are some responsibilities that you have to consider as a WordPress website owner. Here is a summary of the WordPress security best practices for hardening WordPress security, that will encourage you to do that. With the WordPress security expert, I have listed WordPress hosting security checklist includes 10 things you need to know about WordPress protection security for your website. However, the open source platform comes with its own bag of security issues, which makes it vulnerable to hackers. During 2007/08, the platform’s increasing popularity gave rise to a wave of exploits, which were quickly addressed by the company. In 2015, there was an XSS WordPress vulnerability that affected a large number of preinstalled top wordpress security plugins. The issue was addressed in WordPress version 5.1.2. The recent malfunction, however, shows that even though the platform is quite mature, security issue can arise at any moment. Hence, it is better to take all possible precautions while setting up a website on WordPress. You not only secure WordPress hosting but also need to use the best security plugin for WordPress blog site you working with. It really becomes important to follow essential WordPress security best practices. 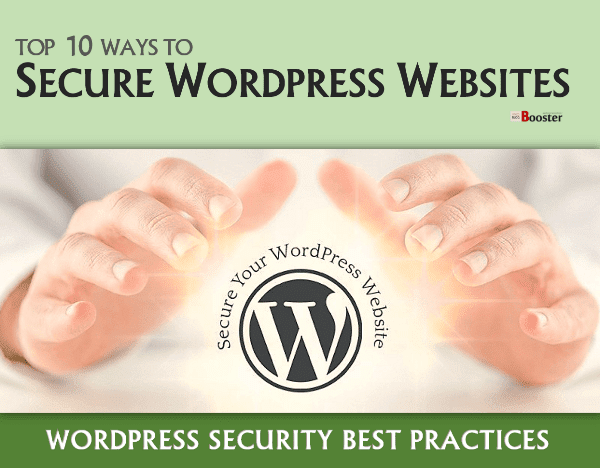 Check out top 10 ways to secure wordpress websites like a pro. At this digital edge, security is the most essential thing for whichever smart device you are using. If you are a regular reader of this blog, last time I have published the article about 7 Actionable Tips To Protect Against Petya/GoldenEye Ransomware | Online Security 2017 that helps you keep you and your system secure. Today I am going to talk about wordpress security tips that will help you on how to be protected from hackers with simple ideas. I hope it will help you to to cop up with wordpress security issues and to keep your WordPress site safe from hacking attempts. But don’t give up, you can quickly secure your WordPress site and prevent the number of hacking attempts with some easy security ideas. There are also few suggestions you can take to harden WordPress, accessible through the WordPress site. The most crucial part in securing your WordPress site is to update it regularly. The open source platform is regularly maintained by the company, which automatically installs minor updates. Apart from that, if you have installed any plugin or themes, you should update them as well. What’s more, you can also automate your updates. However, make sure to conduct automation testing before finalizing it. For major releases, you have to manually update programs. Wordpress malware protection - The reality is that you can never completely secure your website no matter how many precautions you take. Hence, the best way to minimize the impact of any setback is to back up your data so you can restore your website in case of an emergency. There are many free as well as paid WP plugins available that can do the job for you. The 'BackupBuddy' and 'BackWPup' are some plugins that you can use for this purpose. It is better if you back up your data on a reliable cloud service such as Amazon or Dropbox. Real time back up is best, but you can do it once a day as well. Also, delete any plugins that you are not using since you won’t be updating them, making them vulnerable to hackers. Login security wordpress - It remains a very strong and reliable blogging platform, but there is extra work that can be done out of the box to help protect your private data. One of the best ways to prevent an attack is to increase security at login. For that, you can set up two-step verification. Two-step verification entails a password along with a security code that is sent to your phone via SMS. You can choose from several plugins such as 'Google Authenticator' to use this feature. 4. User website lockdown feature. How to improve WordPress security - The lockdown feature can be a real asset. Once you implement this feature, it will lock down your website immediately in case of a hacking attack with repetitive wrong passwords. You will also be notified of any suspicious activity taking place on your site. You can use a plugin to set up this feature. The 'iThemes security WordPress plugin' is one plugin that allows you to set up a number of failed attempts after which it blocks that IP address. 5. Encrypt data with secure socket layer (SSL). How to make WordPress more secure - Secure your admin panel with SSL certificate. SSL security ensures that the data transferred between the browsers and servers is secure, which makes it difficult for hackers to breach it. You can easily purchase SSL security from a third-party vendor. The SSL certificate will help improve your ranking on Google as well since it has recently announced SSL and HTTPS to be one such ranking criterion. 6. Change the ‘admin’ username. Don't use default username & password. Most people choose to use admin as their username for their main administrator account on Wordpress. With such an easy to guess username, you practically give away your website to hackers. In case, you forgot to change the admin username in the first step, you can do it by registering another user. You can give this new user admin rights and delete the previous user. How to make WordPress secure fast - Simple passwords are another easy way to give away your website to hackers. Do not keep passwords with your name, birthdate or any easy-to-guess words. Use complex passwords that are at least eight characters long and have a mix of letters, numbers and special characters. It is best if you frequently change your passwords as it will make it all the more challenging for a hacker to break into your site. If you cannot remember your passwords, note them down. People usually opt for easier passwords so they can remember them. 8. Keep "wp-config.php" file safe. How to build a secure website - This "wp-config.php" file is the most important one in your site’s root directory as it has important information about your WordPress installation. It is not inbuilt in WordPress; in fact, it is created specifically for your site during the installation process. Hiding away this "wp-config.php" file makes it difficult for hackers to breach your site security. You can do that by moving this file to a higher level than your root directory. 9. Monitor your dashboard activity. Test WordPress site for vulnerabilities - Multiple users can make your WordPress more vulnerable. It is best to give admin panel access when to someone only when it’s necessary. However, if you have a multi-user blog and you have to give access, then keep an eye on the dashboard. Any wrong move by a user may cause a huge loss. Following your dashboard activity will make it easier for you to retrace the steps that may lead to the mishap. 10. Change default table prefix. How to secure WordPress from hackers - The default table prefix is WP and all hackers are aware of that. Keeping default table prefixes make SQL injection attack easier, which is why it is necessary to change it. Change the prefix to anything, but don’t choose your domain name. Most small businesses today have their own websites. Not just that, they are also adopting the cloud and software such as CRM that help automate business processes. However, before finalizing any software, you should first test it. For example, before choosing a CRM software, you can opt for a free trial that also gives you access to free pipeline templates. With most businesses shifting online, the importance of website security has increased considerably. With limited budgets, most small businesses and individual bloggers choose to develop and maintain their websites on their own, which makes managing security a bit difficult. However, it is not impossible to protect your website on your own; you only need to adopt the right measures. Article By Kamil Riaz Kara - is a Writer and Inbound Marketer. He has completed his masters in Administrative Science from the University of Karachi. As a writer, he wrote numerous articles on marketing, management, technology, and health. Currently, he is working with Airg team for development work. Check out his firm’s performance reviews.